Ma chi l’ha detto che in inverno dobbiamo seguire la moda dei grigi, del nero e del marrone? Mi sento di indossare il pink, il rosa, per questo terzo giorno di Moda Uomo a Milano. Un colore che riesce a capovolgere il classico look grazie alla sua purezza, quando indosso questa tonalità in qualche modo mi addolcisco perché adoro giocare con me stessa e sfidarmi nei look e nei colori. Maglione e gonna, un completo molto semplice ma ben lavorato accostato a sneakers sportive in tweed e alla mia Gucci Soho, che fino a questo momento non ho mai avuto il piacere di indossare. Una location quasi fiabesca è quella che ho voluto per questo outfit, il colore pink che risplende tra i colori scuri degli arbusti. But who said that in the winter we have to follow the fashion of gray, black and brown? 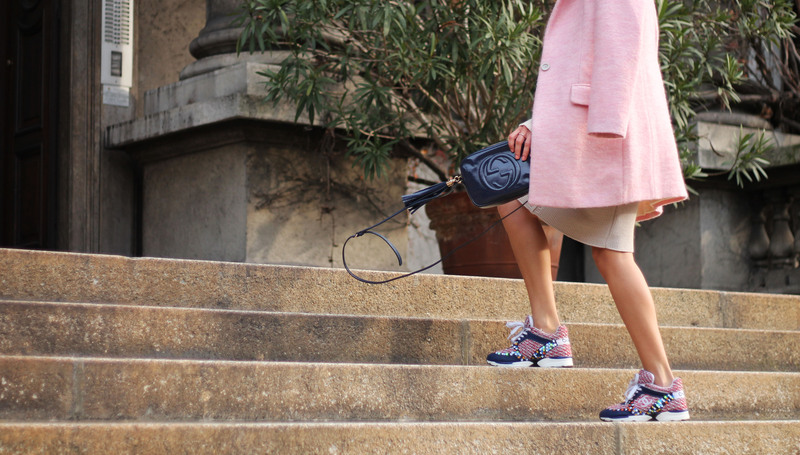 I would wear pink, for this third day of Fashion Week in Milan. A color that can flip the classic look because of its purity, when I wear this shade somehow sweeten me because I love playing with myself and challenge me in looks and colors. Sweater and skirt, complete a very simple but worked well matched with sneakers sporting tweed and my Gucci Soho, which until now I have never had the pleasure to wear. A location almost fairytale is what I wanted for this outfit, the color pink that shines among the dark colors of the shrubs.